John Simon (born October 14, 1990) is an American football outside linebacker for the Houston Texans of the National Football League (NFL). He played college football at Ohio State, and was drafted by the Baltimore Ravens in the fourth round of the 2013 NFL Draft. Simon was born in Youngstown, Ohio. He played high school football for the Mooney Cardinals of Cardinal Mooney High School in Youngstown, Ohio. Ranked by Rivals.com as the No. 36 defensive tackle in the class of 2009, Simon chose Ohio State over offers from Nebraska, Notre Dame and Pittsburgh. He played in the 2009 U.S. Army All-American Bowl. Simon attended Ohio State University, and played for the Ohio State Buckeyes football team from 2009 to 2012. As a senior in 2012, he was named the Big Ten Conference Defensive Player of the Year, and received first-team All-Big Ten honors. He was also named a third-team All-American selection by the Associated Press. He finished his career with 154 tackles and 20.5 quarterback sacks. 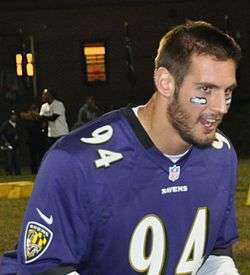 Simon was drafted in the fourth round, with the 129th overall pick, of the 2013 NFL Draft by the Baltimore Ravens. He signed a four-year, $2.545 million contract on May 21, 2013. On August 30, 2014, Simon was waived. He signed with the active roster of the Houston Texans on October 7, 2014. On October 9, 2014, Simon recorded his first NFL sack against the Indianapolis Colts. On March 16, 2016, Simon signed a 585,000 tender with the Texans. In Simon's third season he recorded 53 tackles, 1 fumble recovery and 5 sacks. ↑ "John Simon player profile". sportingnews.com. Archived from the original on 17 October 2014. Retrieved 16 December 2014. ↑ Lesmerises, Doug (November 27, 2012). "Ohio State's John Simon wins Big Ten defensive award, Urban Meyer loses out on coaching award". cleveland.com. Retrieved December 16, 2014. ↑ "2012 All-Big Ten Conference Football Teams". Big Ten Network. November 26, 2012. Retrieved December 16, 2014. ↑ "AP All-America team 2012: Johnny Manziel, Alabama lead the way". sportingnews.com. Associated Press. December 11, 2012. Archived from the original on May 20, 2013. Retrieved December 16, 2014. ↑ Wilson, Aaron (May 21, 2013). "Ravens sign fourth-rounder John Simon to four-year, $2.545 million deal". BaltimoreSun.com. Retrieved 2014-07-22. ↑ "Texans add OLB John Simon". HoustonTexans.com. Retrieved 7 October 2014. ↑ "John Simon". ESPN.com. Retrieved 2016-03-21.